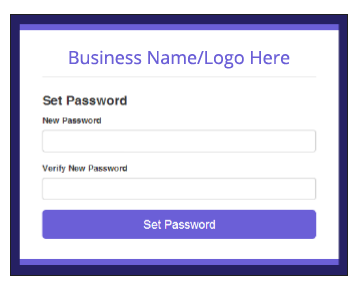 If you are just getting started or a staff member created your user/profile for you, you will receive an email with a link to your account login screen, a username and a link to verify your email address. 1. Enter your desired Password. 2. Confirm by entering it again. 3. Click the Set Password button. NOTE: Your training center login page is located at app.ilearnpro.com/AccountName. This page is designed to be added as a link to the business' website, so there is no login terminal at iLearnPro.com. After logging in, at the top right of iLearnPro, your email address appears with a drop down menu. 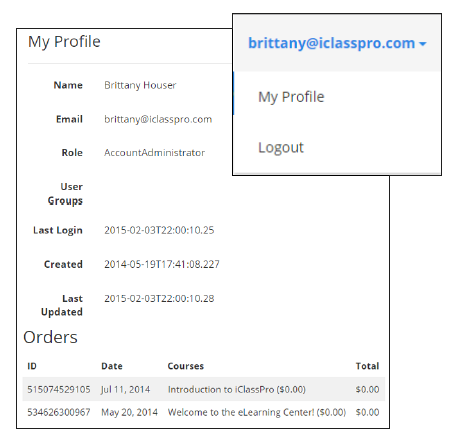 You will use this menu to Logout of iLearnPro and access your Personal Profile. 2. View and update your personal information. 3. Review past checkout totals from your user.